Why should you support DAS and the courts in the court order to euthanize Rusty? It’s the right thing to do. Bet you never thought you’d hear a rescue/advocacy group say something like that – but this court case is important. It’s important to public safety and to the mandate the citizens of Dallas gave their government after Antoinette Brown’s brutal mauling death by a pack of owned dogs. We understand that Dallas City Council will go into a closed door session this Wednesday regarding the lawsuit involving Dallas Pets Alive and Rusty the Dog. We ask you to take the time to read this information on the case and to consider the consequences for any potential agreement between the parties. Unfortunately for Rusty, the law builds a very strong case for Rusty’s court ordered euthanasia. Through a fact based conversation about the law, we will show that despite being leashed, Rusty’s handler did not have the dog in immediate control as required by law. The handler/foster was then unable to regain control of the dog, and the dog caused serious bodily injury through an unprovoked attack, as defined by the law, to a toddler in a public park. Should Rusty pay for human failure? We’d like to say no, but in Rusty’s case, he had the best resources and some of the best informed and reputable rescue people on his side, and he still proved to be dangerous to the public; causing serious bodily injury (not just a bite and release) to a small child. If his dangerous behavior could not be reasonably managed or corrected by a well-respected rescue, we feel the chances of him being safe in the public’s hands, or at a sanctuary, are slim to none. We understand that the rescue is asking the dog be transferred to a sanctuary out of state. We will make a legal case as to why that is a dangerous and unethical precedence for the city to set. We want to start with the dog’s state of mind as this helps us understand the complexity of the situation. One of the witnesses seen in the police body camera footage gives us a little piece of very important information. She says the “DOG WAS EXCITED and the child ran up to it.” Did anyone ask her what she meant by excited? Or what that looked like? Excitedly wagging his tail? Maybe pulling and lunging excitedly on his leash? With less than a day of fostering Rusty under his belt, is it reasonable to think that the foster had known Rusty long enough to identify what Rusty looks like when dangerously over-stimulated at a public event? No, it is not. Was this an experienced foster with behavior dogs? From the foster’s reaction on the video, probably not. They go onto say, “Despite our best efforts, there will always be dogs of various breeds that are simply too dangerous to live safely in society. We can effectively address the danger posed by these dogs by supporting the passage and vigorous enforcement of laws that focus, not on breed, but on people’s responsibility for their dogs’ behavior, including measures that hold owners of all breeds accountable for properly housing, supervising and controlling their dogs. “ We have such laws in the State of Texas and in the City of Dallas. (2) “Serious bodily injury” means an injury characterized by severe bite wounds or severe ripping and tearing of muscle that would cause a reasonably prudent person to seek treatment from a medical professional and would require hospitalization without regard to whether the person actually sought medical treatment. Why is Rusty’s bite style, not his breed, important? It allegedly took four or five grown men to pull Rusty off of the toddler after the unprovoked attack. One man was reported to be punching the dog to try to save the child. Most other dogs would have bitten and released the child, instead Rusty pinned him to the ground and if not for the human intervention, was well on his way to a “ruinous hold and shake” that could have killed the small child. Under the State law, the bite was considered “unprovoked.” The child was not waiving an object, yelling, or threatening Rusty in anyway. Was Rusty defending himself or did his prey drive kick in? Was he just being a dog? Does it really matter? Despite being on a leash, he was on his way to mauling a small child to death and the law exists for just this reason. In the video the police get into an argument with the mother of the injured child. The police can’t seem to hear and process the mother saying, “The dog lunged toward the baby.” Again, by law, just because the dog was on a leash does not absolve the foster of his responsibility to control the dog in a public space. Lunging towards a toddler is clearly not control. None of the witnesses on the police body cam says the baby went up to the dog and the dog bit it – they say the baby ran towards the dog and the dog lunged towards the baby. As noted above, the law allows for the dog owner/ handler to regain control of their dog (822.06), which Rusty’s foster was unable to do without the intervention of others. Rusty is who he is. He is a dog with animal instincts. He can’t really be faulted for that, but he can be deemed too dangerous for the public. Here are a few things to know about Rusty. Rusty was sent by the rescue group to training. Generally speaking, rescues do not send well-behaved dogs to board and training – it’s expensive. Rusty likely went to training because he was a behavior problem. Maybe jumping, mouthing, pulling, leash reactivity? Who knows. But we know he went and that is Rusty’s first red flag. Next, a known behavior dog (Rusty) was sent to a loud, busy, frenetic public space for an adoption event. That’s red flag number two and it’s a big red flag. Once at the event, it did not appear that Rusty had a quiet place, like a kennel off in a corner, to relax and chill if he was overwhelmed or over stimulated. Why is this important? A dog has a bite threshold and a thing called bite inhibition. The more excitement and or threatening things you add to a situation, the lower the dog’s bite threshold gets. It’s called stacking in the training world. Aggression stacking, fear stacking, and excitability – they all stack to take a dog over threshold. With a known behavior dog, it is very important to watch for stacking and to put out the fuse before the explosion. On the day at the park, Rusty showed his stacking in his excitability, which resulted in him lunging, pinning, and holding down the child with his mouth and teeth, tearing the child’s flesh creating a legally defined “serious bodily injury”. Rusty should have never been a candidate to attend such a busy and loud adoption event. Flag number three: Rusty’s foster should have never been allowed to take Rusty to such an event after 1 day or less of having Rusty in his custody. Rusty’s foster should have been trained on how to watch Rusty for stacking and how to advocate for Rusty when he was getting over excited. Red Flag number four: Was high risk Rusty wearing an “ask to pet” vest or leash? Was he behind a barrier? Nope. Without a solid attentive handler or any visual signage on the dog, the public was left to assume a dog at a public adoption event – one that is front and center – is not a safety risk. While all dogs have potential to bite, Rusty’s incident was more than a dog giving a human a correction bite – his attack had serious and dangerous intention. It is all to common for rescues to make missteps like these for the pressure put on them to “save them all’ and to do it without spending loads on money on behavioral rehabilitation with expensive specialized trainers; but to put a behavioral dog out in the public is a big responsibility that comes with accountability. While under oath during a court proceeding, the head of the rescue said she would not take Rusty into her home. She should be applauded for her honestly. So why is the rescue fighting for Rusty’s release to a sanctuary? This dog bite scenario is not just about Rusty’s life, the rescue’s lawyers are likely looking to reduce the rescue’s civil liability by keeping Rusty alive. If Rusty is released, he couldn’t be THAT dangerous, right? That would make it look more like the bite was the victim’s fault. Again, the law puts the onus on the dog’s foster/handler for control of the dog, but the lawyers will be looking for anything to sway a jury. Does the rescue have insurance? Do the 501’s officers have insurance? These things matters when it’s time to hold them accountable for a serious bodily injury claim. The fight for Rusty’s life might be more about the financial impact on the rescue if his court ordered euthanasia, and his final designation as a dangerous dog, stands. (2) knows the dog is a dangerous dog by learning in a manner described by Section 822.042(g) that the person is the owner of a dangerous dog, and the dangerous dog makes an unprovoked attack on another person that occurs at a location other than a secure enclosure in which the dog is restrained in accordance with Subchapter D 1 and that causes serious bodily injury, as defined by Section 822.001 , or death to the other person. (b) An offense under this section is a felony of the third degree unless the attack causes death, in which event the offense is a felony of the second degree. 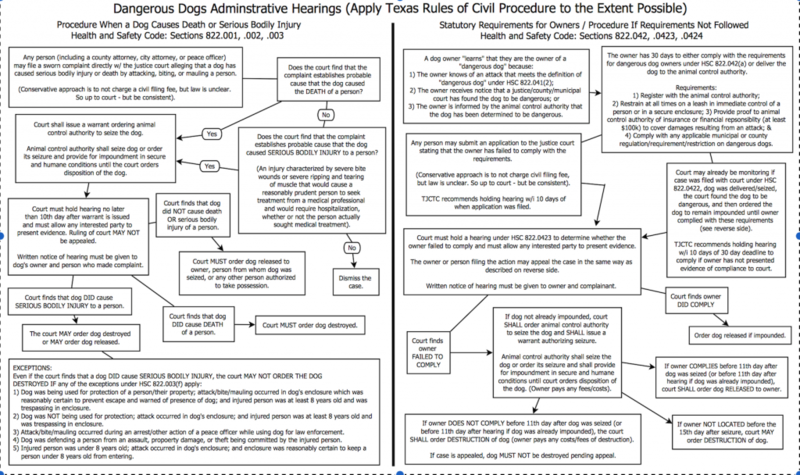 (c) If a person is found guilty of an offense under this section, the court may order the dog destroyed by a person listed in Section 822.004 . (d) A person who is subject to prosecution under this section and under any other law may be prosecuted under this section, the other law, or both. Leading industry professionals will recommend one of two sanctuaries for dangerous dogs. Neither of those sanctuaries is likely interested in accepting Rusty into their program. That says a lot. Sanctuaries are not intended to house every mean or aggressive dog in the country. That would not be safe for employees and they would not be able to properly care for the dogs. From a bite perspective, “bite and release” style dogs are more likely to get into a sanctuary than the “hold and tear” bite style we saw from Rusty. One style is more damaging and life threatening to employees and staff than the other. Additionally, not all sanctuaries provide an equal quality of life for a dog either. Sanctuaries often turn into neglectful hoarding situations as they collect more difficult dogs over time. Sending Rusty to a reputable sanctuary, one that has recently been inspected by authorities, is important to the dog’s safety and wellbeing. If the head of Rusty’s rescue, and the countries leading sanctuaries, won’t take Rusty because of the risk factor associated with his behavior, why would the City Of Dallas agree to send this dog out of the state? ? It would be unethical to do so. Recently, the City of Dallas intentionally removed the option to remove a dog from the city as a remedy after a dangerous dog conviction. This was part of the city’s dangerous dog law updates. The intent of that change is clear: do not make a known dangerous dog someone else’s problem. Not only would it be unethical to move this dog out of state, it is unethical to continue to allow this dog to suffer mentally. Where this is concerned, DAS is following the letter of the law. The rescue is allowing this dog to sit in protective custody, while arguing their right to an appeal, where the dog cannot interact with people or go outside. The dog is doomed to deteriorate further into madness day after day. Why? To save his life? The last year of his life has been miserable. He is literally going out of his mind. There are worse things than a humane euthanasia and Rusty has been experiencing them for the last year, through no fault of DAS. It has been the rescue’s decision to selfishly keep this battle going instead of doing what is right by Rusty. The rescue continues to point fingers at DAS, when DAS is in fact, for the first time in years, doing their job and following the law. The dog’s fate is not DAS’ decision; the decision belongs to the courts. Let’s talk about the intent of rescue in general. The average stay of a shelter dog at DAS is about a week. Seven days. Rusty’s stay at the shelter has cost 1 dog a week, for the last 52 weeks, their lives. That’s 52 dogs that didn’t get a chance because Rusty had their space. Is one dangerous “behavior dog” more important than 52 other dogs? Is that the intent of responsible rescue? Was Rusty’s mental health and well being considered knowing he continues to sit in protective custody, going crazy? Again, DAS cannot change this – they are following the law and the court order. They have no control to do anything but follow the law and the judge’s orders. Rusty’s behavior issues are now much more intense and serious than when he entered the shelter. This is important to note as in order to transport the dog across state lines to the rescue’s recommended sanctuary, the dog will need a health certificate from a veterinarian. DAS will likely not put their vets at risk to perform the exam. This means that the dog will need to be sedated (without a proper health check), catch-poled, potentially muzzled, put in a crate, and then will need to be driven out of the county to get his vet exam. The dog will need to be put in a heavy duty steel crate for transport as he will likely tear up a shipping crate. The dog will need to be re-sedated across his journey to NY – which is a risk in itself. Someone will have to get him out for potty breaks or he will have to sit in his own urine and feces until he arrives in NY. After a year in protective custody at the shelter, I wouldn’t want to be the guy who has to take him out of his kennel and then GET HIM BACK IN IT. Transporting Rusty is a dangerous and risk process for all involved. Why Dallas would skirt the intent of the law and pass that risk on to well intentioned, but ill prepared and under trained group of people? I don’t know. Public sentiment and direction to council has been for public safety first. The City should not allow pressure from one small, but vocal, segment of the population to dictate the dog’s release, despite the risk to public safety. The public gave Dallas City Council a mandate to protect the citizens from dangerous dogs, spiking dog bites, and loose dogs. The Council passed on the mandate to the City Manager, and the City Manager hired new management at DAS to get the job done. It is Councils’ job to stand behind their selected professional expert in executing the mandate. Council should not cave to public pressure from emotional rescues and animal advocates who would put the life of one dog over that of any city’s citizens’ safety. It is not Council’s job to determine Rusty’s fate or to try to influence the courts. The responsibility lies solely on the courts to interpret and enforce the law through their rulings. Again, DAS’ current Director, Ed Jamison, was given a mandate to reduce dog bites and dangerous dog issues while raising the live release rate at the shelter. Director Jamison’s public position is: a known dangerous dog, that has causes serious bodily injury, should not be returned to its owner or sent to a sanctuary to become someone else’s problem. (edit for clarity: The euthansia decisions was not the Director’s – it was the courts.) We’re not talking about a garden variety dog bite with Rusty, we are talking about serious bodily injury to a child. If the law was not written for this, what was it written for? An enormous amount of time and money has been allocated to protecting the citizens from dangerous dog issues across the city. Progress and gains are being made, but allowing public pressure from the emotional rescue community to cause the city to disregard that a child was seriously injured, at an adoption event at one of the city’s top tourist attractions at the city’s core, that will create a return to lawlessness and lack of accountability that will take the efforts backwards years in just an instant. Allowing Rusty to leave Dallas to go to a sanctuary will also create a continued air of discrimination towards southern residents. Citizens in the southern districts are not afforded the same access and political capitol to influence the outcomes of their dogs’ cases. Their dogs are currently being euthanizes for serious bodily injury incidents. A rescue group should be held to the same standard as the city’s residents. As the attorney’s argue appeal and jurisdictions issues in the courts, city attorneys should not bow to public pressure to release Rusty. The law is the law. If people don’t like it, they can advocate for changing it, but our city and our courts should uphold the law. Do we want Rusty to be euthanized for being a dog? Of course not. But humans failed Rusty long before his incident at he park. To allow Rusty’s dangerous behavior problems to persist and to continue to endanger the public is not an acceptable answer. But Rusty’s case can be a learning experience for all dog owners and rescues alike. We can grow and better help other dogs from Rusty’s misfortune. We must agree to recognize that not all dogs are safe for the public, even after time and money are put into saving and rescuing the dogs. Dogs are individuals influenced by both nature and nurture. Not all dogs can be made safe through love and good intentions. There are some that we must say good-bye to. It is not a failure. We must not condemn those who make those hard decisions. This is why the term no-kill is so dangerous. We should strive to save them all, but we must acknowledge and recognize that occasionally, saving a dog equals a humane euthanasia. As our animal culture changes and the unwanted homeless dog population decreases and humane animal care becomes the norm, these tough decisions will become more and more infrequent. Our goal should always be the safety and quality of life for humans and animals alike, with the safety of humans paramount. Rusty’s case is not unique, just recently a leashed dog at a Starbucks in North Dallas lunged and bit a woman. The presumed owner was sitting at a table drinking a coffee when the dog lunged, biting the woman in the hand and stomach. The owner fled the scene. Recently, Dallas Cowboys player Dak Prescott’s dog was in the news for getting loose, attacking another dog, and then biting the other dog’s owner. A Collin County court ruled the dog needed to be removed from the city of Frisco. Is that dog in Dallas now? Living next to you? Prescott’s dog allegedly broke through a fence to get to the dog it was attacking. According to national insurance institutes, the average dog bite cost $35,000. Are you ready for Frisco’s ex-problem to become your next-door neighbor? Of course not. And we should not make Dallas’ dangerous dogs someone else’s problem either. No one ever wants to say a dog should be euthanized, but the law defines when a dog can and should be deemed dangerous and subsequently euthanized. (Edited for Clarification: State law also defines penalties for Serious Bodily Injury) We need to respect those laws and let the courts work unemotionally to sort out the details and make fact based rulings. To prevent our companion animals from ending up as court cases, we must learn how to clearly communicate with our four legged friends so we can better advocate for them by recognize their signs of stress or overexcitement. • Efforts to teach proper dog etiquette to owners and children. • Efforts to teach doggie body language to owners and children. • Efforts to teach fosters signs of stress and anxiety in their foster dogs. • Efforts to share best practices for behavioral dogs at adoption events. • Rescues should budget for training resources for foster volunteers and behavior dogs. Together, we can prevent situations like Rusty’s from ever happening again. And isn’t that what this should really be about? You won’t believe what our neighbor Jack wants for his birthday! We ask again: Dear Mr Mayor, what’s it going to take? Interactive Dog Bite Map - are you at risk? Donna : Can you get a petition going?